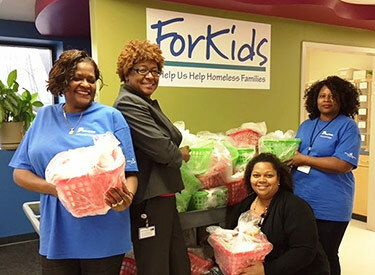 Dominion Energy volunteers help collect goods for an after-school program that helps homeless children in Norfolk. These grants are designed to support organizations that provide greater stability and a better life for people in need. RICHMOND, Va. – Dominion Energy is inviting nonprofit organizations across the company’s footprint to apply for grants of up to $25,000 each to meet critical community needs in communities. For the fourth consecutive year, the Dominion Energy Charitable Foundation has pledged $1 million to help meet critical needs for food, housing, medicine or medical services. Last year’s Critical Community Needs grants helped 160 nonprofits provide an array of essential services. For instance, ForKids Inc. was awarded $25,000 for its after-school program that helps families struggling with homelessness. Watch a video to see how ForKids helps young people succeed in school and life. For this year’s grants, eligible organizations in targeted areas of Connecticut, Maryland, New York, North Carolina, Ohio, Pennsylvania, South Carolina, Utah, Virginia, West Virginia, Wyoming and other areas within Dominion Energy’s footprint are encouraged to apply. On-line applications will be accepted until Oct. 5, 2018.
have a proven track record of meeting basic human needs and preventing future needs. For more complete details or to apply, go to www.dominionenergy.com/communityneedsgrants. Nearly 6 million customers in 19 states energize their homes and businesses with electricity or natural gas from Dominion Energy (NYSE: D). Through its Dominion Energy Charitable Foundation, as well as EnergyShare and other programs, Dominion Energy plans to contribute more than $30 million in 2018 to community causes throughout its footprint and beyond. The Foundation supports nonprofit causes that meet basic human needs, protect the environment, promote education and encourage community vitality. Please visit www.DominionEnergy.com, Facebook or Twitter to learn more.